Global Positioning System (GPS) L1-frequency (1.575 GHz) amplitude scintillations at São José dos Campos (23.1°S, 45.8°W, dip latitude 17.3°S), located under the southern crest of the equatorial ionization anomaly, are analyzed during the Northern Hemisphere winter sudden stratospheric warming (SSW) events of 2001/2002, 2002/2003, and 2012/2013. The events occurred during a period when moderate to strong scintillations are normally observed in the Brazilian longitude sector. The selected SSW events were of moderate and major categories and under low Kp conditions. The most important result of the current study is the long-lasting (many weeks) weakening of scintillation amplitudes at this low-latitude station, compared to their pre-SSW periods. Ionosonde-derived evening vertical plasma drifts and meridional neutral wind effects inferred from total electron content measurements are consistent with the observed weakening of GPS scintillations during these SSW events. 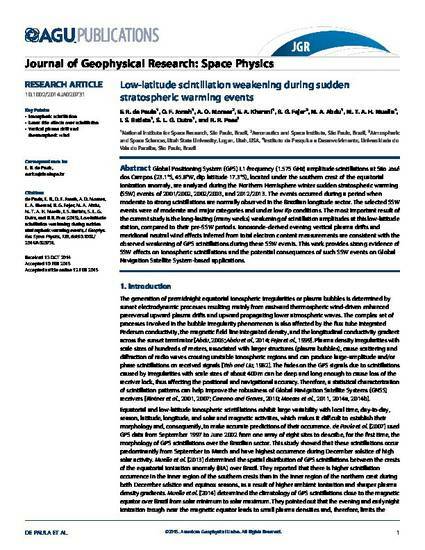 This work provides strong evidence of SSW effects on ionospheric scintillations and the potential consequences of such SSW events on Global Navigation Satellite System-based applications.